Innovation is critical to our economic and social prosperity. Yet acquiring the required resources is especially difficult for novice innovators, who lack competence and confidence. Crowdsourcing has the potential to change this. 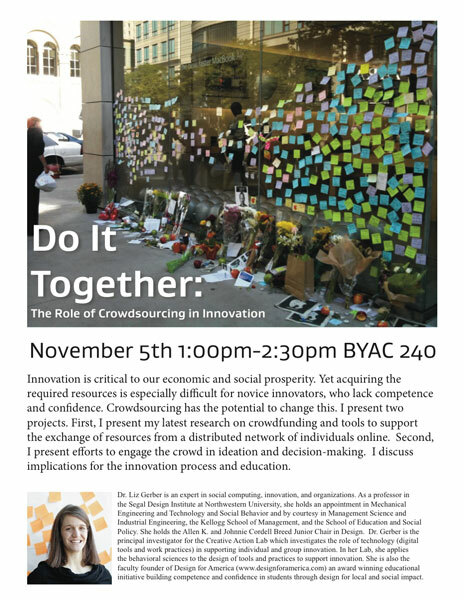 Liz Gerber presents her latest research on crowdfunding and tools to support the exchange of resources from a distributed network of individuals online and efforts to engage the crowd in ideation and decision-making. 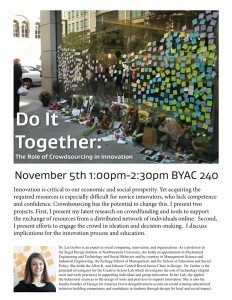 The lecture will include a discussion of the implications for the innovation process and education. Liz Gerber is an expert in social computing, innovation, and organizations. As a professor in the Segal Design Institute at Northwestern University, she holds an appointment in Mechanical Engineering and Technology and Social Behavior and by courtesy in Management Science and Industrial Engineering, the Kellogg School of Management, and the School of Education and Social Policy. She holds the Allen K. and Johnnie Cordell Breed Junior Chair in Design. Gerber is the principal investigator for the Creative Action Lab which investigates the role of technology (digital tools and work practices) in supporting individual and group innovation. In her lab, she applies the behavioral sciences to the design of tools and practices to support innovation. She is also the faculty founder of Design for America (www.designforamerica.com) an award-winning educational initiative building competence and confidence in students through design for local and social impact.